94 pts - James Suckling - A beautiful wine, deftly balanced with lots of red berry fruit character and pretty floral aromas. A great vintage with trophy winning quality! Medium dark with black-red colour. Explosive nose of red fruits and infused cherry, the palate projects cranberry and plum with smoky strawberry high tones. Bright with a good grip and velvety mouthfeel with considerable ageing potential. 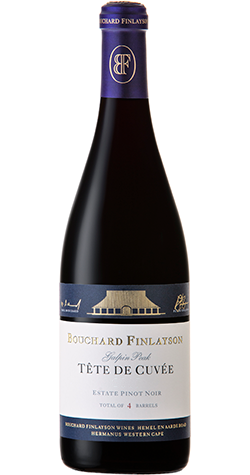 Bouchard Finlayson’s flagship wine is the Galpin Peak Pinot Noir, which has won many an award and accolade. Growing on the slopes of Galpin Peak, repeated vintages of this path-blazing wine continue to reflect a true celebration of Pinot-crafting, consistently endorsing the Hemel-en-Aarde Valley as a jewel in the hunt for this illusive grape.